Tendon strain or tendon inflammation (tendonitis) can occur from tendon injury or overuse and can lead to a rupture. Call your doctor if you have signs of minor tendon problems. Minor tenderness and possible swelling increases with activity. There is usually no specific event causing sudden pain and no obvious gap in the tendon. You can still walk or stand on your toes. 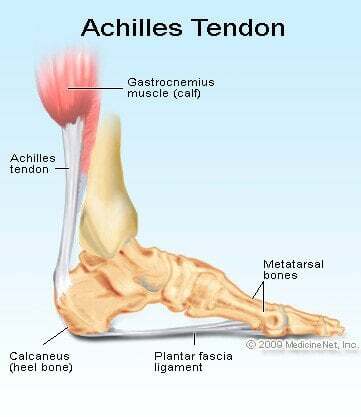 Acute calf pain and swelling can indicate a tear or partial tear of the Achilles tendon where it meets the calf muscle. You may still be able to use that foot to walk, but you will need to see a specialist such as an orthopedic surgeon. Surgery is not usually done for partial tears. Sometimes special heel pads or orthotics in your shoes may help. Follow up with your doctor to check for tendonitis or strain before resuming activity, because both can increase the risk of tendon rupture. Any acute injury causing pain, swelling, and difficulty with weight-bearing activities such as standing and walking may indicate you have a tear in your Achilles tendon. Seek prompt medical attention from your doctor or emergency department. Do not delay! Early treatment results in better outcome. If you have any question or uncertainty, get it checked. Rest the injured part. Pain is the body's signal to not move an injury. Over-the-counter pain medication is an option. Acetaminophen (Tylenol) is helpful for pain, but ibuprofen (Motrin, Advil, Nuprin) might be better, because these medications relieve both pain and inflammation. Remember to follow the guidelines on the bottle for appropriate amounts of medicine, especially for children and teens. Risks are associated with surgery: anesthesia, infection, skin breakdown, scarring, bleeding, accidental nerve injury, higher cost, and blood clots in the leg are possible after surgery. Nonsurgical treatment involves extended casting, special braces, orthotics, and physical therapy. Avoids the normal complications and expenses of surgery. Some studies show the outcome is similar to surgery in regard to strength and function. There is risk of an over-lengthened tendon with inadequate tension. Extended immobilization can lead to more muscle weakness. Nonsurgical treatment has a higher incidence of re-rupture than surgical repair. Nonsurgical treatment is often used for nonathletes or for those with a general low level of physical activity who would not benefit from surgery. The elderly and those with complicating medical conditions should also consider conservative nonsurgical treatment. Consult with an orthopedic surgeon to determine treatment and rehabilitation. Participate in early consultation and regular visits with a physical therapist for range-of-motion and strengthening exercises. Prevention centers on appropriate daily Achilles stretching and pre-activity warm-up. Maintain a continuous level of activity in your sport or work up gradually to full participation if you have been out of the sport for a period of time. Good overall muscle conditioning helps maintain a healthy tendon. The majority of people return to normal activity levels with either surgical or nonsurgical treatment. Many studies indicate a better outcome with surgery, especially in younger patients. Athletes can expect a faster return to activity with a lower incidence that the injury will happen again. Physiotherapy can expedite recovery time. Typically as the rupture site heals, a small lump remains from the scarring. Atrophy of the adjacent calf muscle is not uncommon. Weight bearing commonly begins at about six weeks with a heel support. Return to running or athletics is traditionally about four to six months. With motivation and rigorous physical therapy, elite athletes may return to athletics as early as three months after injury. What was the treatment for your Achilles tendon rupture?